Finding well-fitting, durable handwear is a challenge most winter climbers face each season. Gloves are expensive, easy to lose, and usually don't last very long. Additionally, it's good to have a quiver of gloves for warmer and colder conditions, a set of gloves that work really well for harder ice pitches and a thin, sticky pair for hard mixed climbing. Back when climbers used leashes glove selection seemed less important. If your hands were getting tired you could tighten down your leashes and keep moving. With leashless tools, thin gloves with a good grip are mandatory. I have tons of gloves in my closet at home, but only a few pairs get used regularly. The gloves that I do use regularly can be divided into two groups - work gloves and sending gloves. Work gloves are used for belaying, rappelling, climbing easy pitches and for approaching. They get trashed. 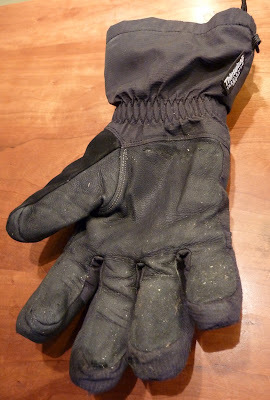 These gloves need to be durable, waterproof, relatively warm and not too expensive. I will frequently wear out 2-3 pairs of "work gloves" each season. 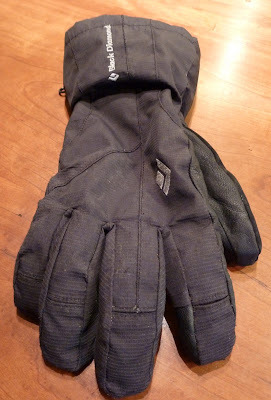 My work glove of choice over the last two seasons has been the Black Diamond Glissade. At $59 a pair of Glissade gloves costs far less than most other waterproof gloves. With a leather palm, Thinsulate insulation, a gauntlet shaped wrist, and a BDry insert these gloves get the job done and won't break your bank. How does Black Diamond make a fully waterproof, full-conditions glove for $59? Well, for starters, they're made outside of the US. However, the real alchemy here involves the BDry insert. Black Diamond started using BDry four or five seasons ago as a substitute for Gore Tex in their less expensive gloves. How does BDry work? It's simple really, they sandwich a glove-shaped plastic bag between the shell and the insulation in their gloves. This brilliant decision makes for the most waterproof gloves I've ever worn. Until the plastic lining breaks, no matter how worn the glove is, it will remain waterproof.This is more than I can say for many of the Gore-tex gloves I've used in the past. Why is Gore-tex such a popular application in gloves? If I could venture to guess, I might say it's because W.L. Gore is an industry giant that makes companies contractually "agree" to use their products regardless of whether it works well or not. Gore-tex, which really isn't very breathable, relies on an effective DWR (durable water repellent) coating to be effective. A garment's exterior fabric must remain dry, creating an air layer for the semi-permeable Gore-tex to allow moisture, in the form of water vapor, to pass through. As soon as "wet out" of the exterior fabric occurs Gore-tex stops being breathable. On a pair of gloves, which get rubbed, brushed and pulled at constantly, the DWR coating might only last one day at wear points. What's the point of having an "expensive" breathable membrane then? I'm not sure there is a point. It's a gimmick. The BD Glissade gloves have no Gore-tex, and they've never let me down. As long as I don't sweat too much, these gloves will stay dry all day long. I've used them for backcountry skiing, ice climbing, working mixed routes, climbing Rainier and as a basecamp glove on the Ruth last spring. They are cheap and durable. I've led plenty of WI 5 in them too. For really technical pitches something with a bit more dexterity is nice, but for pure slugging these gloves work very well. They're good for moderate mixed climbing too. The only drawback to the Glissade I've found so far is that the leather on the fingers doesn't wrap around the edges. Like most less expensive gloves, there is only leather on the palm. I'm okay with this, for the price of one pair of Gore-tex gloves I can have two pairs of gloves that will comfortably last the entire season.